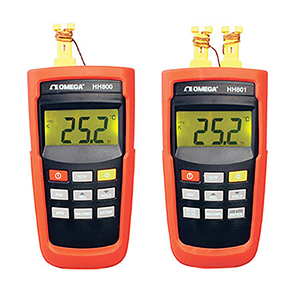 The HH800 and HH801 handhelds are easy to use Type K input thermocouple thermometers. Both feature a large 31/2 digit LCD with a maximum reading of 1999. The HH800 is a single-input model while the HH801 has two inputs and allows for display of T1, T2 or .T (T1-T2). Both models feature T/C offset adjustment and are °C/°F switchable. The HH800A and HH801A offer most of the features of the HH800 and HH801, but both also have data storage capability and accept J or K Type thermocouples. The HH801B and HH801C offer most of the features of the HH801, but they accept four different thermocouple types. Both units feature settable Hi/Lo limits for both inputs and have an integral alarm beeper. The HH801B also features three displays for simultaneous viewing of both inputs and the differential. Note: Comes with 4 “AAA” batteries, Type K thermocouple (one per channel), rubber boot and complete operator’s manual.